The Ultimate Super Bowl Snack Semifinals Start NOW. VOTE! You God-damned animals voted Ridged Chips out? In favor of Kettle Chips??? What kind of perversion is this? Fine, you know what? Go scratch, more Ruffles for me. The big news, as you may have gathered, heading into the Ultimate Super Bowl Snack Semifinals is the defeat of number-one seed Ridged Chips by sixth-seeded Kettle Chips. Can the mighty Kettle take down Super Bowl stalwart Tortilla Chips? Based on the results of last's year's Ultimate Super Bowl Dip Playoffs, which saw Classic Salsa losing to Guacamole in the Finals, it seems unlikely. But we shall see! Introducing Your Ultimate Super Bowl Dip Champion: Guacamole! 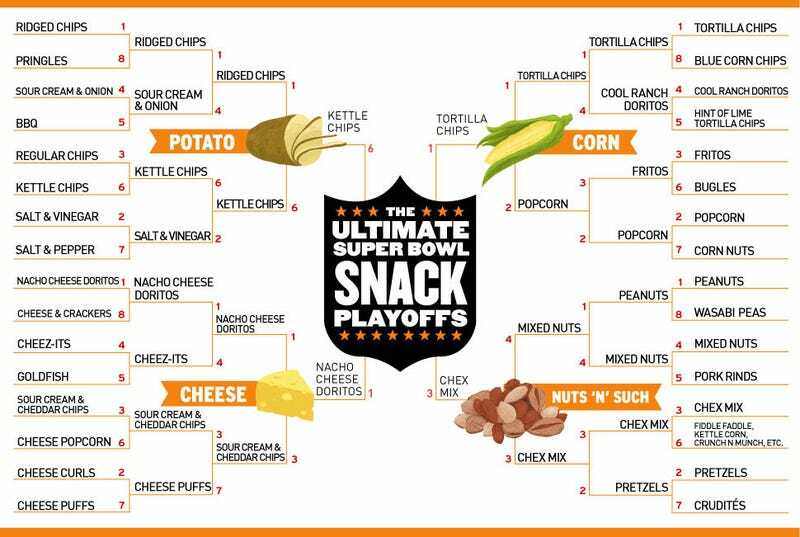 On the other side of our bracket, Nacho Cheese Doritos handily dismissed Sour Cream & Cheddar Chips and will move on to face the little snack that could, the third seed from the Nuts'n'Stuff Division, Chex Mix. Come on, Chex Mix! You can do it, lil' buddy! And with that, we vote! Polls close at noon EST on Wednesday, providing that EST still has infrastructure left come Wednesday at noon to support polling operations. Happy Snowtimes!